Daniel Radcliffe’s next outing will now be set to wonder amongst a terrifyingly haunting residence stalked by the titular character. There is some pretty atmospheric content in this trailer from foggy marshland and villages, to an orchestra of clown like toys moving in time to an equally unsettling score. The only details we get derive from an eery rhyme about the woman herself and you can’t help but feel sorry for Radcliffe, as he will undoubtedly face some horrors that I’m sure will scare both himself and the audience witless upon its release. 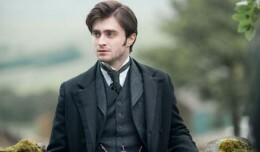 Comments for The Woman In Black Trailer are now closed.